It was hot, hot, hot. 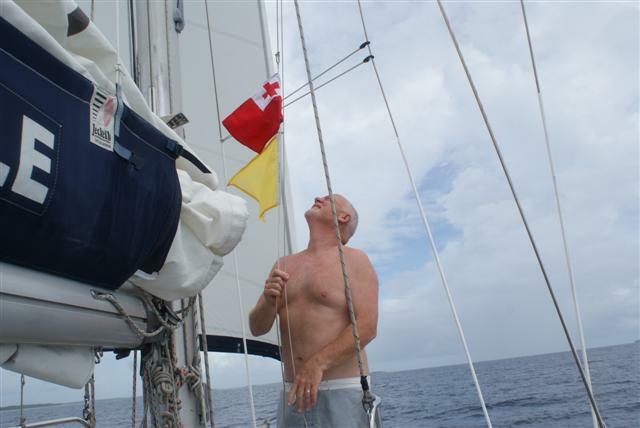 The sea was 25C and the air temperature was 28C and Bill had his shorts on. We spent the afternoon putting up the mark II bimini cover that I had made while we were in NZ, we needed protection from the sun (there’s no pleasing some people!) I noticed on the chart that we were going over ‘Horizon Deep’ in the Tongan trench a sea area 10190 meters deep that’s deeper than Everest is tall, how amazing is that. Pity the depth sounder goes into melt down and turns itself off over 120 meters, well it is Raymarine. The wind was still coming from the north east but it was gradually dying as the forecast had predicted. We turned the engine on at 18.00 and motored through the night. When I went off watch at 1am I could just see the light glow in the night sky coming from Tonga. 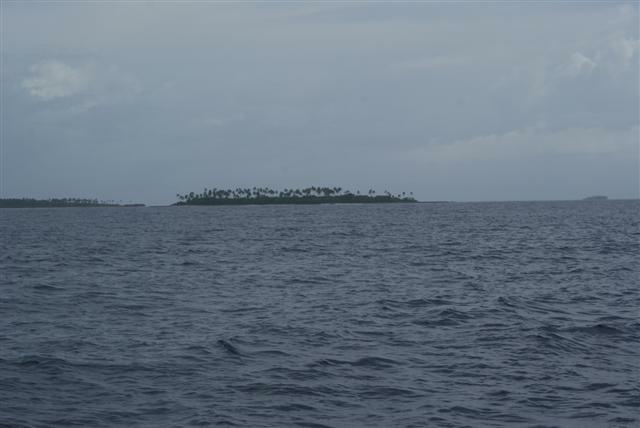 We arrived off the approaches to Tonga the next morning. We had a tricky pass to get through but made it without any trouble. We made our way into the harbour of Nuku’alofa at 10.00. The only mooring avaiable was what they call ‘Med mooring’ which means you drop an anchor over the bow while you reverse in and tie your stern to a wall. The problem here was that it wasn’t a wall but a sloping pile of stones and it soon became obvious that we needed fairly long lines because we didn’t want to be too close not knowing what was on the bottom. Unfortunately as we were quite early in the season their wasn’t any one to help. We motored back out into open water so Bill could unwrap the dinghy from it’s long distance wrapping and pump it up. Then we had to get 2 Panama warps out from where they are buried behind the saloon berth. We went back into the harbour, I got into the dinghy and took the two Panama warps tied together with me. I tied them to a bollard on the stony wall and gently let them out of the dinghy while Bill was dropping the anchor and motoring backwards. I drove towards him and handed him the end of the line to tie on and make the boat fast. Unbelievably it worked really well first time although the whole process took about an hour. When the man from the customs arrived he was a big chap as most Tongans are. The only way onto the boat was using the dinghy as a ferry, he took one look at that and asked us to move to the fuel dock. Grrrr he had no idea how difficult it had been tying up but we moved as requested and were checked in by no less than 4 different officials. The second boat to be checked in this year. So we had arrived in Tonga. We had covered 1358 miles in 239 hours giving us an average of 5.68 nm per hour, not bad although we had an average of 6.2kts from Fiji to NZ.